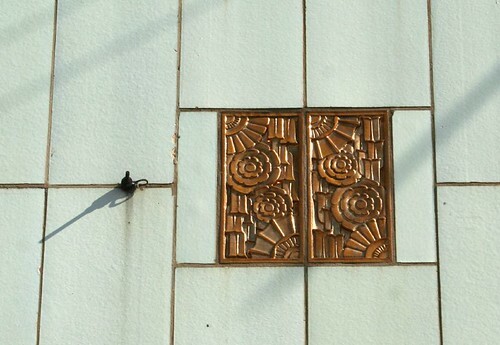 Chicago is not particularly famous for its Art Deco heritage. 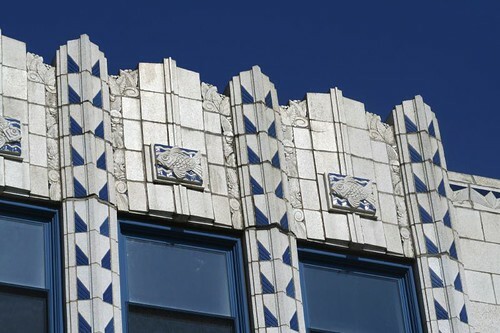 Although there are a few fine Deco skyscrapers downtown, most notably the amazing Carbide & Carbon tower, most of the Art Deco architecture I’ve found has been scattered and hidden. 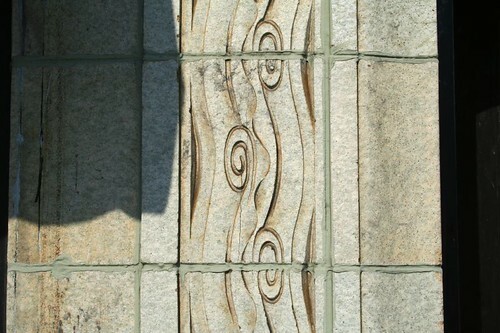 The work of architect Andrew Rebori is worth special note, and I’ll get to it in the next post. 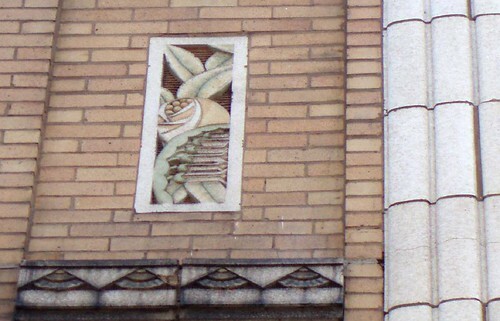 For this one, I want to share some of the more “ordinary” Art Deco buildings I’ve stumbled across in my travels. 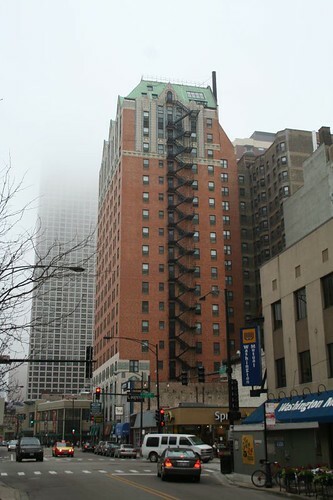 This is 10 N. Elm Street, a highrise at the north end of River North, designed by B. Leo Steif in 1928. …the ground level was obliterated by one of the most unfortunate “modernizations” I’ve ever had the misfortune to lay eyes on. It burns my soul to think what they destroyed for this. 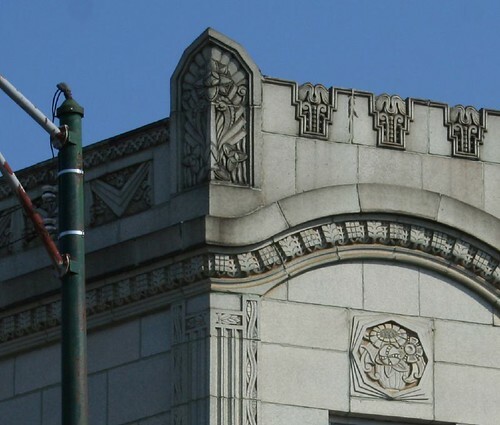 Next up, we have a jewel of a building out on western Lawrence Avenue, currently home to the Interstate Blood Bank. 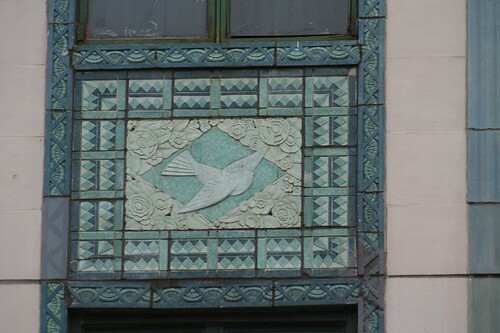 It was a neighbor of the recently-demolished Metro Theater building, and remains the crown jewel of the avenue’s architecturally rich commercial buildings. Sadly, a quick web search reveals nothing about its past. It’s a stunning composition in creamy-white terracotta, with deep blue glazed highlights. 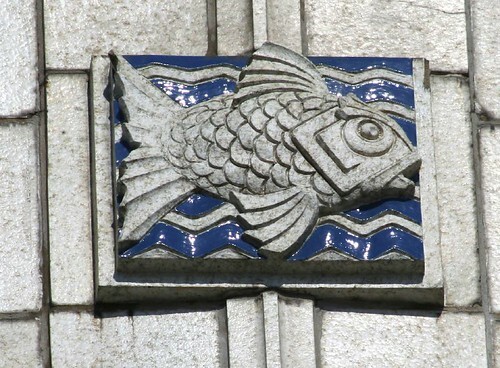 Geometric plants, shapes, and fish are arranged on the spandrel panels and in ascending piers running the height of the building. 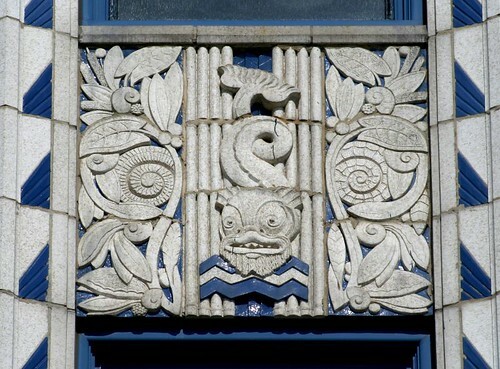 All that said… I don’t know where these guys went fishing, but I ain’t never seen a fish that looked like the ones on this building. Our next stop is on a side street in eastern Rogers Park, 1521 W. Sherwin. 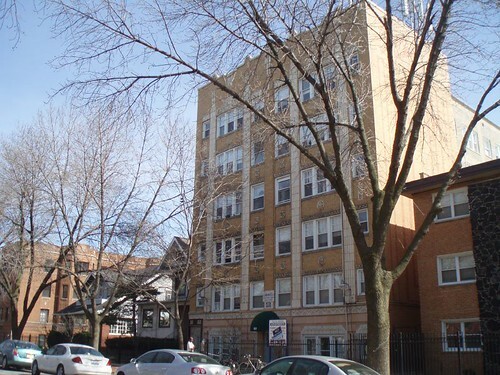 This six-story apartment building doesn’t look like much from afar, but first impressions can be deceptive. 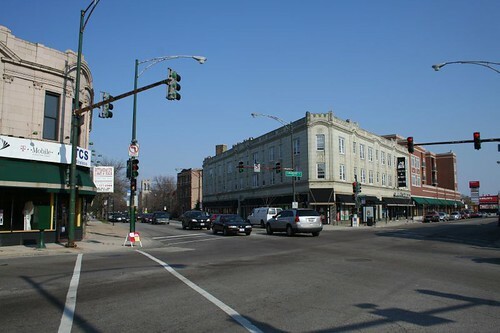 Next stop: Milwaukee Avenue at Montrose, where this sea-green building is squeezed to fit into the acute angle of two major streets’ intersection. The overall effect of this building isn’t quite as Jazz Age as it could be; there’s something more historical about its general aura. But the details tell a different story. 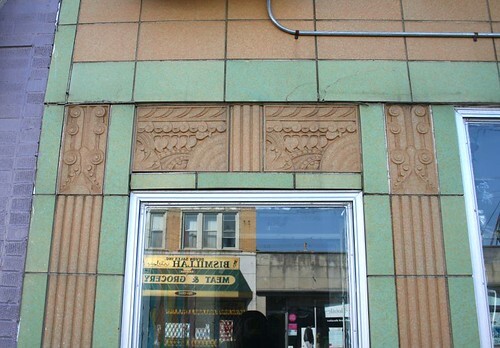 A stroll down Devon Avenue offers many rewards, architectural and otherwise. 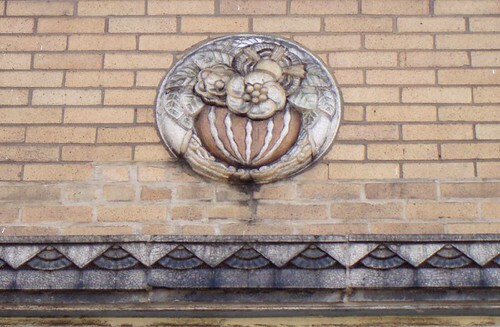 Among the wildly varied historical styles that adorn the avenue’s many commercial buildings, a few Deco details may be found. And that’s all I got for now. The hunt continues! 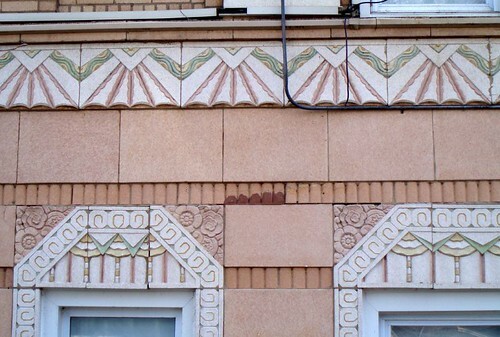 This entry was posted in Art Deco, Terra Cotta. Bookmark the permalink. 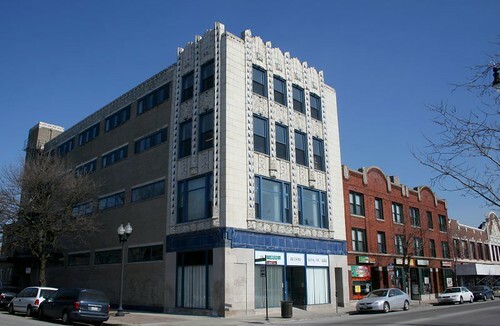 The building on Lawrence was built in 1931. Architects were Schmidt, Garden and Erickson. 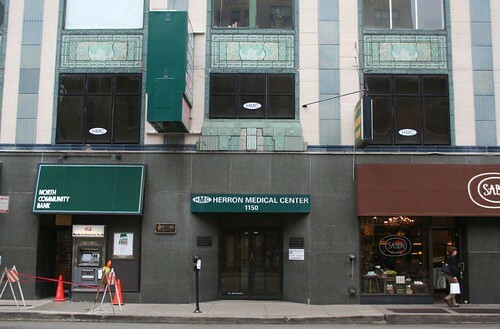 I’m assuming that Schmidt and Garden are the same individuals from the Chicago School Schmidt, Garden and Martin firm of Ward’s warehouse and Schoenhofen brewery fame. 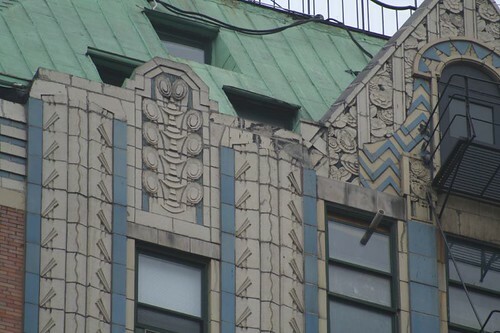 That would explain the Chicago School elements on the Lawrence building.There is TONS of deco in Chicago, but it is quite often hidden, as you mentioned. I know the one you mean, and I think I’ve even snapped it once or twice. Thanks for the tip! 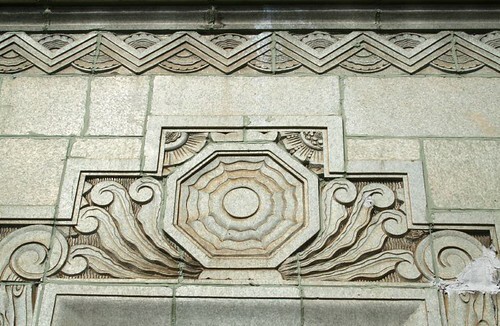 Yeah, there is a lot of deco in Chicago which is hidden, or even more the case, overlooked. I love how passionate you are about our beautiful architecture. Thank you!